Disease is therefore the work of the devil. JEHOVAH-RAPHA– The Lord That Heals …”I am the God who heals you”. Provision for our bodies. So “before you were saved you were healed”. 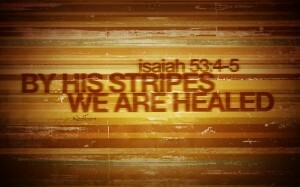 So if you are saved by the work of Christ then you are (current tense – Is 53) or have been (past tense – 1 Peter) healed. Q: Why did He come? Q: Is healing for everyone or only those who are saved?